Hello everyone, Mayline here today with a CAS card that I made for you. My card for today is very clean, simple and easy to make. One story just came out while making this card. Hahaha… The two foxes have just met on the street at night and they realized that they are falling in love. 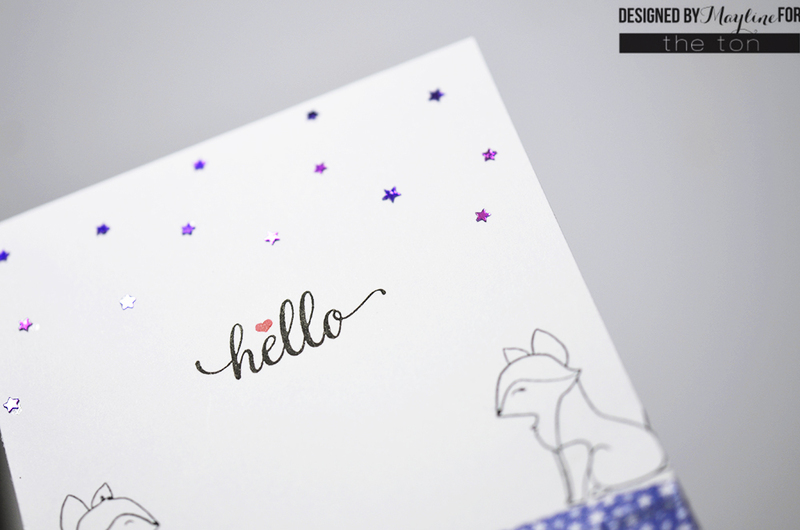 To create this card I started off by stamping foxes from our Hey Foxy stamp set onto white cardstock. Towards the bottom of this card I used masking tape. After that I stamped the sentiment from our new release stamp set Large Peony 1. Lastly I adhered some Mini Stars – Purple on the top of the cardstock. I created an some video clip showing how much these mini stars shine! I hope you enjoyed my card. Thank you for stopping by. ELEGANT card Mayline – LOVE the mini stars shining in the sky and the tape across the base … it looks like the foxes are at the waters edge and the stars are reflected from above!!! Thank you for sharing your video too – they really do shine!!! You do a story like no other. Charming card and, oh so, sweet.